Despite the recent improvements to schedules I find myself wishing for a subtle improvement to the Insert > Data Row feature. 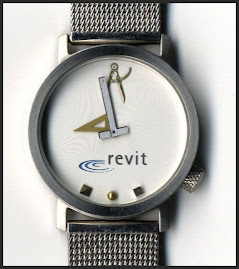 Paul Aubin commented on this at the Central States Revit Workshop during his Friday session for Interiors. I'm not alone, and the people in his class were on our side too. The majority of the time we are likely to use it to insert a new Data Row. Since the Insert Above and Insert Below only is relevant or available when working on cells in the header they are far less likely to be used. I think Data Row ought to be a separate button. The other two options could appear to the side and as two buttons, one above the other, if we click on a cell in the header. The current process adds clicks to what used to be a single click experience. Just say no to more clicks, it's a clicktastropy! 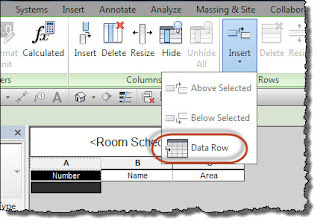 Sorry only Rooms, Spaces and Sheets can create a new row, a record without a corresponding "real" element in the model. If you've got a "dummy" ceiling type then you've got to put one somewhere in the model so it will show up in the schedule.